(Health.com) -- Mia Procida, 14, will be starting her eighth summer at Camp Pocono Trails in Reeders, Pennsylvania, at about the same time a new television show, called "Huge" rolls out on the ABC Family network. 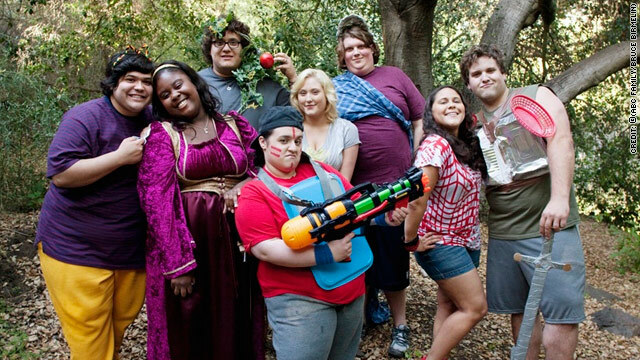 Starring Nikki Blonsky and Hayley Hasselhoff, the show portrays the adventures and misadventures of seven teens attending a weight-loss camp a bit like Procida's. It makes its debut on Monday, June 28. Procida, for one, is excited about the premiere. "The commercial reminds me of my camp in some ways," she says of Camp Pocono Trails, which was the subject of the MTV documentaries "Fat Camp" and "Return to Fat Camp." But will "Huge" provide role models for overweight kids and inspire them to lose weight and get healthy? Or will the show skip obesity's physical risks to focus on the psychological and social drama? Kim Rozenfeld, one of the show's executive producers, says the health risks, including diabetes, will not be glossed over or over-dramatized on "Huge." "We attempt to illustrate a lot of the conditions that revolve around teen obesity, but in a way that ties into the story and the characters, so makes more of an impact," he says. In one scene, for example, a camper with diabetes is shown testing his blood sugar. "The episode is not about that, but it's a featured part of the character, so we try to incorporate it organically," Rozenfeld says. A budding actress who has appeared in some plays and independent films, Procida has some inside information on "Huge" -- she actually auditioned for it. The show, based on a novel by Sasha Paley, isn't an exact reflection of life at her camp, she says. The teens on "Huge" appear to be very obese, maybe even morbidly obese. (A person 5 feet 6 inches would have to weigh 248 pounds to be considered morbidly obese, which is a BMI of 40.) "Most of the characters look pretty big, and the people at my camp are not huge," says Procida, who lives in Norwood, New Jersey during the school year. "Some may even be underweight, but out of shape." "In the beginning, they line up the campers in bathing suits [and] they don't do that in my camp," she says. "Your weight is kept confidential in camp." Pocono Trails campers get weighed when they arrive, and then again every Sunday. Experts (who haven't seen the show yet) agree that it has the potential to cast a sympathetic light on the plight of overweight teens. However, there are concerns that it may also downplay the complexity and the seriousness of teen obesity in an attempt to garner ratings. About 17 percent of children and adolescents ages 2 to 19 are obese, according to the Centers for Disease Control and Prevention, and the excess weight may shorten their life span. Childhood obesity can lead to diabetes, heart problems, and hypertension, says Mary Jo Rapini, a psychotherapist with the Methodist Weight Management Center, in Houston, Texas. "It is so bad that we believe this is the first generation that will not outlive their parents." In addition to health concerns, there are psychological effects too. Although the teen years are an emotional roller-coaster ride for everyone, they're especially difficult for obese and overweight children. A 2003 survey showed that obese teens liken their quality of life to that of childhood cancer patients undergoing chemotherapy. "Their magnitude of unhappiness should not be under appreciated," says Dr. Evan Nadler, M.D., the co-director of the Obesity Institute at Children's National Medical Center, in Washington, D.C. "A show that features obese teenagers and delves into some of their issues is really important and hopefully informative about the issues that these children face." For a TV drama to resonate, there needs to be drama. And there is drama aplenty when it comes to childhood obesity and summer camp, says Rapini. "I hope it gets across some of the psychological and family issues underlying obesity," she says. Weight loss and healthy habits aside, these camps are also about socialization. For most campers, sleep-away camp is a time for many firsts, including first crushes. "There is a hill in between the boys and girls camp, but we still see the boys a lot," Procida says. "Younger kids who don't get guys at home may have six boyfriends in a week," Procida says. "It's really funny." Camp Pocono Trails campers are ages 7 to 19. "The truth is there is a certain amount of drama in camp," says Tony Sparber, the director of Camp Pocono Trails and two other New Image weight-loss camps -- Camp Vanguard in Florida and Camp Ojai in California. "I hope the portrayal captures the true essence of this type of camp and is not exploitive," he says. A great summer at camp can be measured in all sorts of things, including new skills mastered, new songs learned, and, for campers like Procida and the cast of "Huge," pounds lost. Procida, who describes herself as "chubby," says that "the most I ever lost is about 20 pounds, but some kids lose 30 to 40 pounds a summer." The fact that so many campers return summer after summer shows that it is not a magic bullet, but another way to encourage teens to lead healthier lives. Procida agrees that camp is about more than just shedding pounds -- it's about social networking too. "My closest friends are from camp and we are all in the same bunk every year." Dr. Angela Celio Doyle, Ph.D., a clinical psychologist at the University of Chicago, says that the show could work if it offers a sense of social support. "'Huge' can be very helpful if overweight teens watch and think 'Gosh I am not alone' and 'other people feel this way too,' " she says. Dr. Rebecca Puhl, Ph.D., the director of Research and Weight Stigma Initiatives at the Rudd Center for Food Policy and Obesity at Yale University, in New Haven, Connecticut., is cautiously optimistic about the impact that a show like "Huge" can have. It has the potential to portray the "negative impact that teasing and victimization can have on overweight teens, but this will backfire if they are made fun of or if obese teens are shown as targets of humor," she says. It's a delicate balance. "You want to shed light on the difficulty and struggle obese kids are facing but not reinforce stigma, and as of yet, no show has been able to accomplish this," she says. "Maybe 'Huge' will. We will see."